Congratulations on your new status as parents. Now that you have your little bonny baby in your arms, your happiness knows no bounds. But have you wondered that within a span of just 12 months this tiny little newborn will begin to start walking and making meaningful monosyllabic sounds to call you! A baby's life journey during these 12 months is very crucial to pave the way for a healthy toddlerhood. Your newborn is just getting used to this beautiful new world. 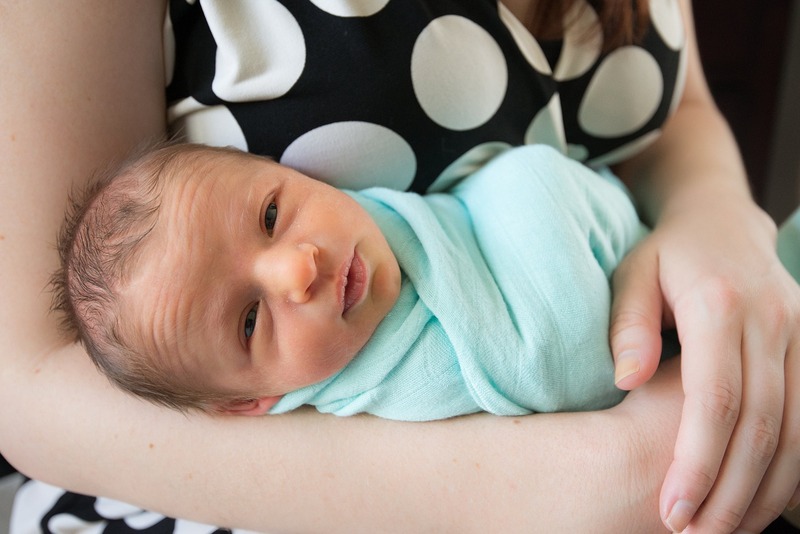 But everything is new to their little eyes and therefore, the first few days after birth can be a little unsettling for the baby as well as the mother. But soon you will fall into a rhythm of things and with time your bond and understanding of each other will only get better. Weight loss: Most babies lose close to 10% of their birth weight within the first few days of being born. The extra fluid that adds to their birth weight is lost within a few days and this results in the loss in weight. Weight gain: But wait till the end of the first month and your baby will have gained some decent weight, approximately half an ounce every day. Neck strength: Your baby's neck is still not quite strong to hold on its own. So you should ensure that the little head is supported whenever you hold your darling. Reflexes: Ever wonder who taught your tiny pea to latch on to your breast and feed? Reflexes that were developing while in your womb are now ready to be put to use. The sucking reflex is one of the strongest in the newborn because that's how they will find nourishment. Also, they tend to hold on to anything that is put in their palms. This is a survival instinct to prevent babies from falling. When startled, your baby will stretch its limbs and then bring them back. This is known as the Moro Reflex. Sleepyheads: Yes, a newborn is famous for sleeping most part of the day. A healthy newborn sleeps for 20 hours a day. But don't feel too relieved reading this. The 20 hours sleep is not in a single stretch. Babies wake up at inconsistent intervals to fulfill their innate needs such as pooping and feeding. They wake up at the slightest hint of discomfort or even if there is a change in temperature that they don't prefer. 1-month-old babies don't have a fixed schedule. And therefore your body's natural clock goes for a toss. But it's worth the trouble – your baby will be old enough soon and become an inseparable part of your life. Development of the senses: You will notice your little bundle's eyes wandering away or even crossing when trying to focus. Your baby is nearsighted right now and has a blurry vision. It will clear within a few weeks. Your newborn's sense of hearing is quite mature and they can recognize your voice. Sharp and loud noises can be stressful for their little ears, so avoid making loud noises around the baby. Your baby has a sense of taste and smell already and prefers sweet to other flavors. Both these senses are still developing and a baby can only differentiate broad categories of taste and smell. It can detect your smell every time you bring your breasts close to the baby's mouth for feeding. Recognition of patterns: Within a month, your newborn develops the cognitive capability to recognize bright and colorful designs and objects. They tend to be attracted to dangling objects and their gaze steadies to focus on moving things, for example, a colorful hanging toy over their cribs. Face recognition: While in the womb, your baby could recognize your voice. By the time she is one month old, your baby can identify your face from other faces and try to gain attention with her big dreamy eyes. Crying to communicate: This one of the predominant aspects of a newborn – crying. Although it may drive you up the wall, the shrieks and wails of your baby are her only ways to express her needs. One-month-old babies will cry for everything – to eat, to sleep, to poop, to feel warm, to cool, and even when they are bored. But once you begin to figure the crying patterns for different needs, soothing your baby will become easier. Excitement and entertainment: Even if we are talking about a little baby the size of a pumpkin, the newborn cannot be left without any entertainment. Swaddling, cradling, incoherent cooing, and rocking are their entertainment programs and they need to feel stimulated and excited. If your baby cries for attention and stimulation by the time it completes a month, your baby's emotional development is progressing well! Gurgling when happy: Has your newborn suddenly made the cutest cooing sound hearing your funny voice? Often babies make gurgling sounds to show their contentment. Watch your baby while she is sleeping and her funny smiles will melt your heart. Comfort in your arms: Babies are very receptive to love and care. Notice how your cuddle bun stops crying when you hold her in your arms and hum a lullaby. Babies love soft touch and they feel secure when cradled by their caregivers, especially the mother whose scent, face and voice they already recognize. Skin to skin touch: Babies love their mommies' skin. Try to keep your baby close to you at least during her first few months. The warmth exuded from your body will not only soothe your newborn but also give her physical and emotional comfort. Breastfeeding is nature's way of keeping a baby close to the mother. Talk to your baby: It is true that your baby will not understand a word of what you say, but interacting with your baby will build the foundation of your bonding and make it stronger with time. Exciting high pitched sounds will stimulate your baby's sense and she won't cry due to boredom. Stay alert: The first few months will be a difficult time for a mother as far as rest and sleep are concerned. Your baby is still trying to settle in with a routine and may have an erratic sleep cycle right now. Also, she needs to be fed every two hours. So even if your body is pulling you down, you have to stay alert to ensure that your baby has all her needs fulfilled on time. A newborn's life is tough as she has just made her out from her comfort zone inside the mother's womb into a big strange world. Give her some time, and she will become the best thing that ever happened to you.